Approximately two years ago, Perris Union High School District took its first public steps embarking on a journey that is changing the face of education in the region. The first public step was the unveiling of the Scholar+ teaching and learning initiative. There is much to be chronicled on Scholar+ and the exciting things happening at PUHSD and we want to share them. Our newly announced PUHSD blog will be the format to expand on the development, implementation, and future goals of Scholar+ as well as other district achievements. It is an unfortunate truism in education that many school districts have a disjointed organizational structure. Often, divisions are working on different paths that are not connected to each other. That is not to say that the individual paths don't have merit or are wrong. It’s just that these paths often lack connections to each other. This truism is more apparent in the traditional model of school districts in which the Business Services/Technology Departments and Educational Services Departments are on different paths. Schools have hardworking, talented, and caring people working in these departments and there is no doubt their commitment to education is solid. But what great things can happen when the paths connect, intertwine, or become one? PUHSD was no different in the traditional business/technology and curriculum arrangement. Excellent people and teams of people were thoughtfully doing the noble work so necessary in education. But something interesting happened. The word “interesting” does not do justice to the developments that unfolded. At PUHSD, the two roads started to meander into each other, briefly following a similar path but then breaking off. This intertwining happened often enough that the players became familiar with each other, trust was established, relationships were formed (some might say alliances were forged), and a new team started to emerge. All of these things allowed PUHSD to shed the tradition and what emerged was Scholar+. There is a saying that “If you want to go fast, go alone. If you want to go far, go together.” This encapsulates our philosophy and explains how PUHSD has been able to persevere with Scholar+. While planning, scheduling, and coordinating on Scholar+, we worked together. Hierarchy was suspended as to allow voices to be heard. We met in person and online, took advantage of office spaces and virtual spaces, and used the collaborative tools available to us as we traveled together. With the conditions being set at PUHSD, it was time to define the focus. That focus was clearly on the learner. The term-or brand-Scholar+ was purposely selected as to cause every decision to be focused on the learner, our scholars at PUHSD. Some of the attributes we want our students to develop include being inquisitive, creative, motivated, collaborative, productive and innovative. All of these attributes and more are ones that can be found in the type of scholar needed for the modern world. Also, the naming of Scholar+ as the teaching and learning program included designating that term for our wireless network. The name Scholar+ is what the students, parents, staff and community see when they access our network and see our devices on campus and in the community. But Scholar+ did not start with the creation of the brand. The plan started with the careful crafting and creation of desired outcomes. It should not be missed that PUHSD did its research. We dove deep and wide into the best school programs and excellent research provided by experts in various fields and organizations. We took the wise recommendations to start with desired outcomes and moved forward on our journey. 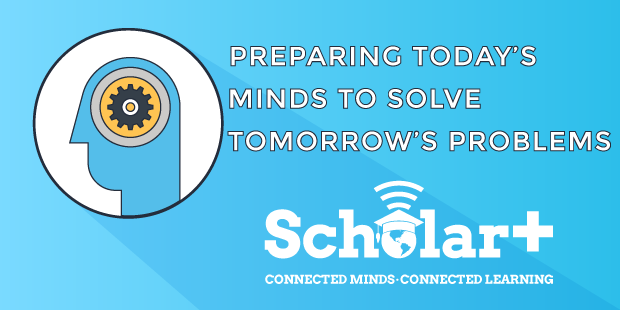 The elements of Scholar+ address the desired outcome of providing all students with the opportunity for 24/7 learning that is personalized and flexible. Other desired outcomes include students using 21st Century tools to do authentic work, the ability to collaborate and communicate effectively with peers, experts and their teachers, access libraries of digital content that provide multiple pathways to learning, pursue real-world issues and topics of deep interest, and understanding and practicing digital citizenship. Lastly, Scholar+ ensures that PUHSD provides equitable access to learning experiences for all students and especially students in underserved populations—low-income and minority students, students with disabilities, and English language learners.